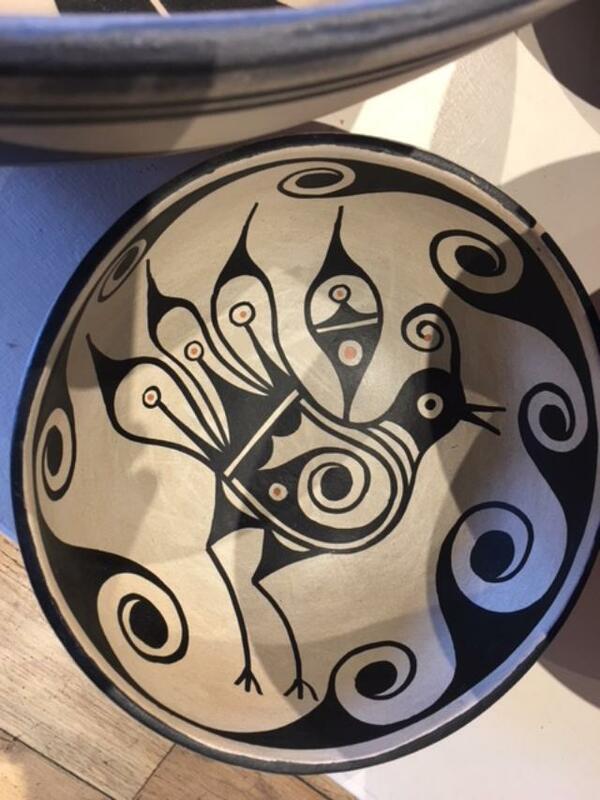 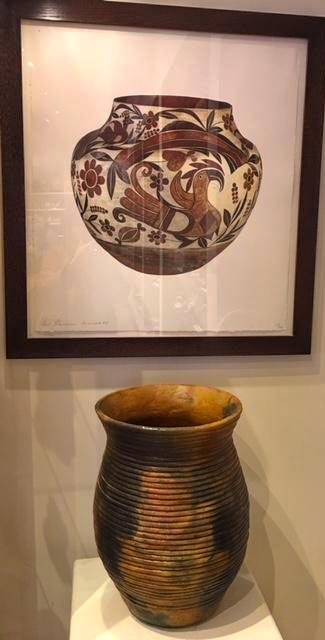 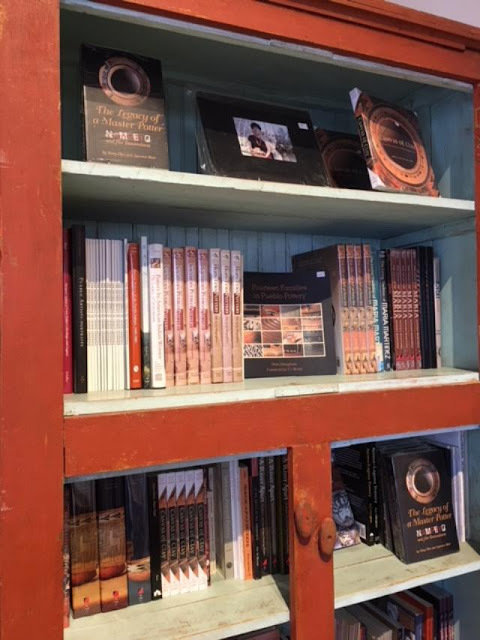 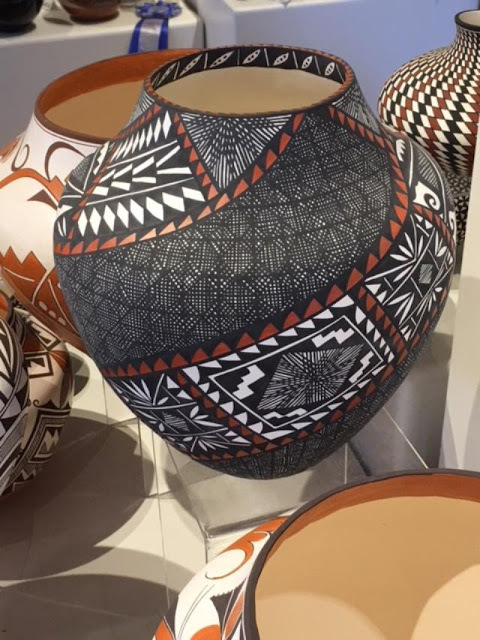 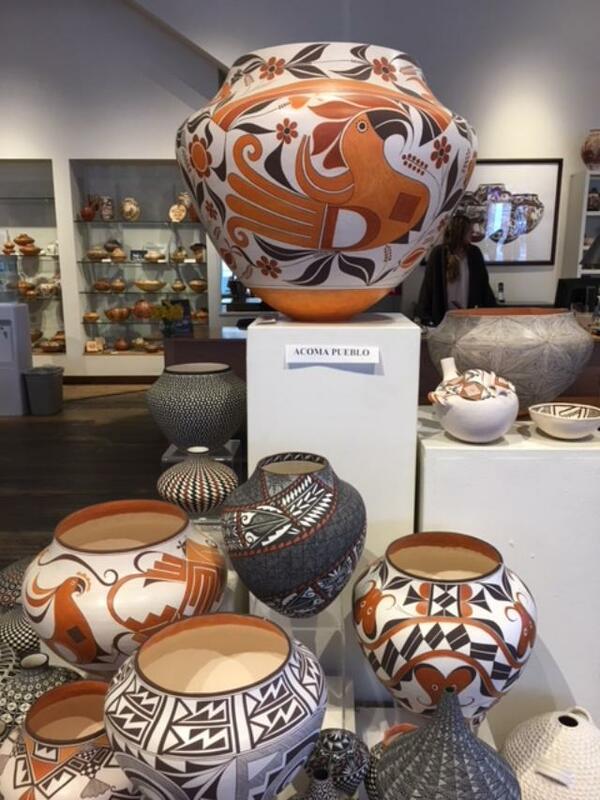 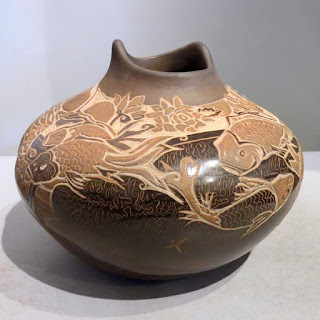 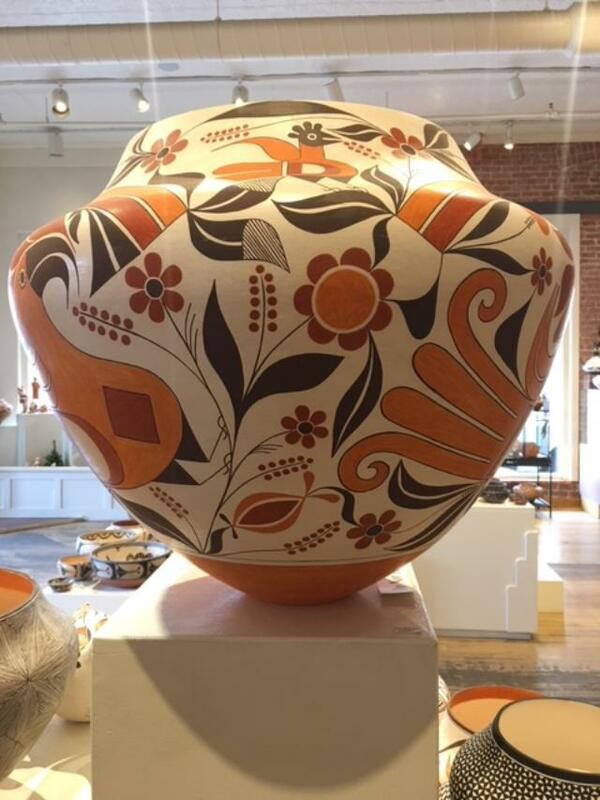 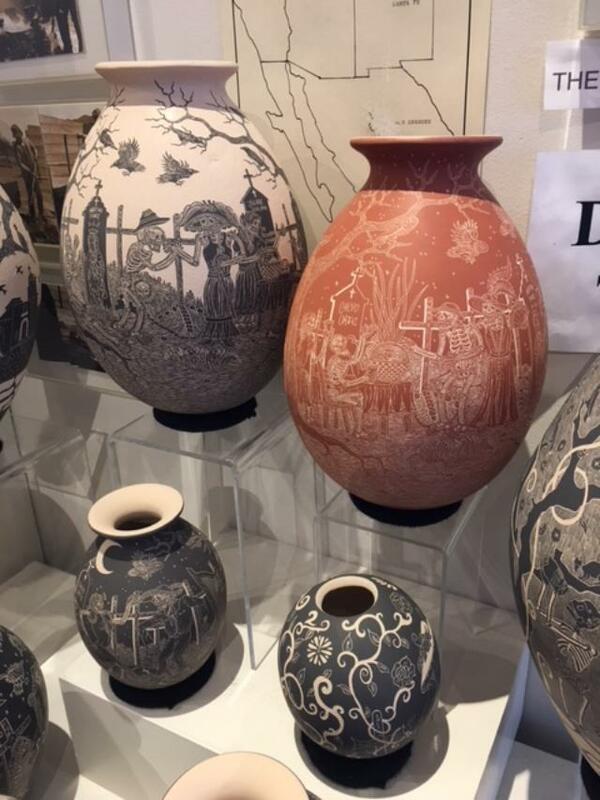 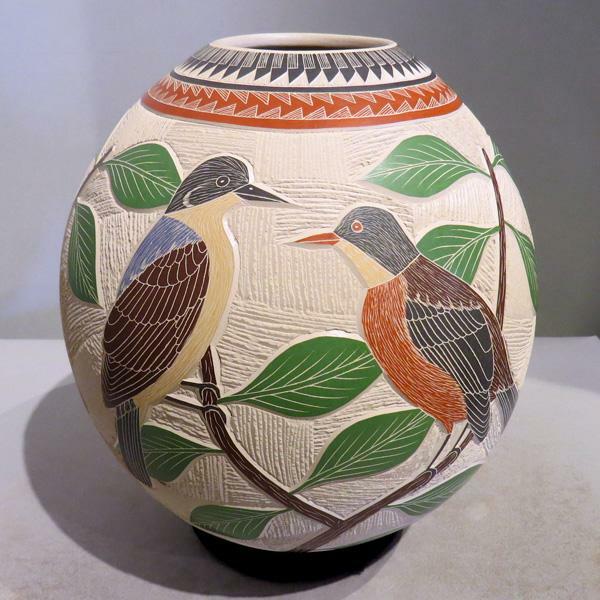 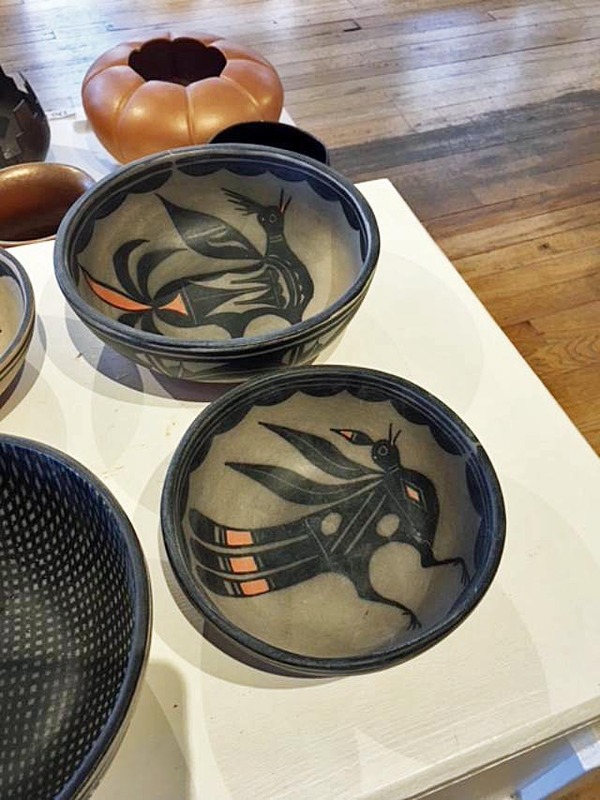 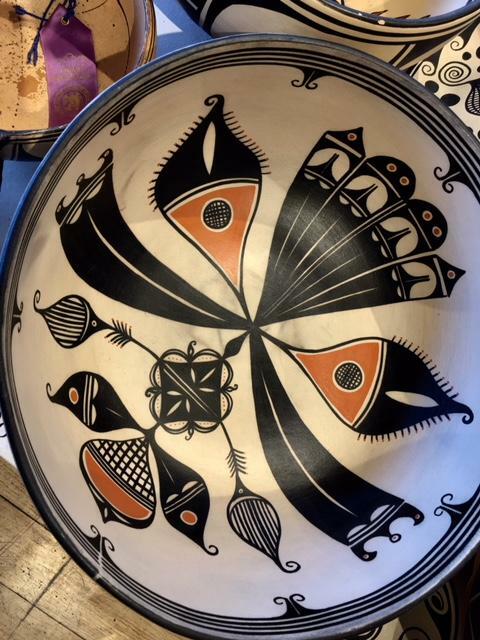 ANDREA FISHER FINE POTTERY - at the corner of West San Francisco Street and Don Gaspar, just off the Historic Santa Fe Plaza - is the premier American Indian pottery gallery in the world. Their handsome windows, displaying just a fraction of their vast New Mexico Pueblo Pottery Collection, are a magnet for anyone walking by. 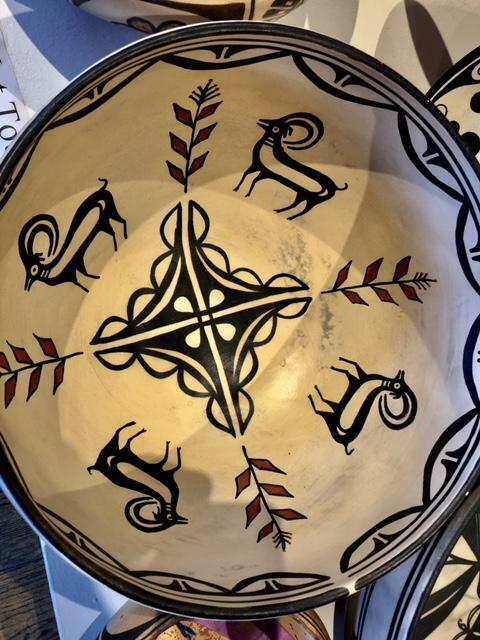 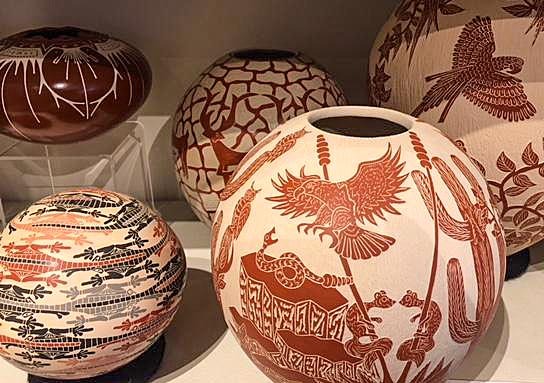 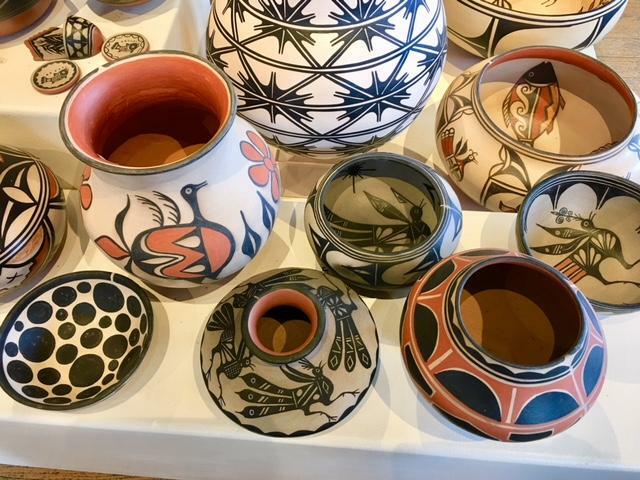 You just have to nip in and experience the full beauty of these magnificent hand-made, hand-painted Native American pots, dating from the 1880's to the present. 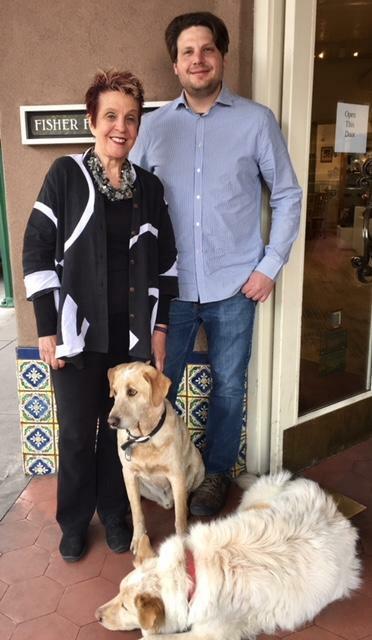 Andrea Fisher, son Derek and their resident dog/greeters. 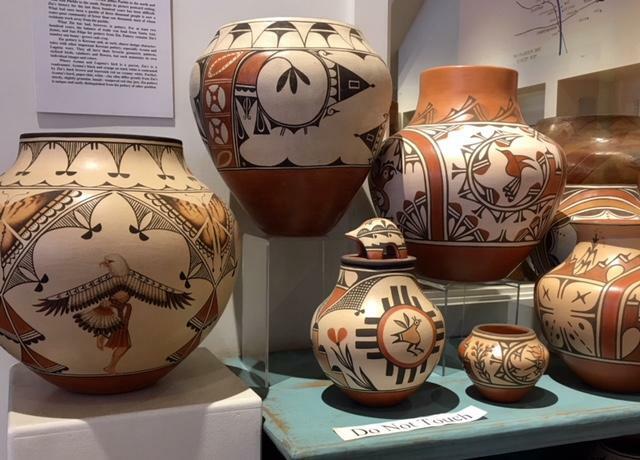 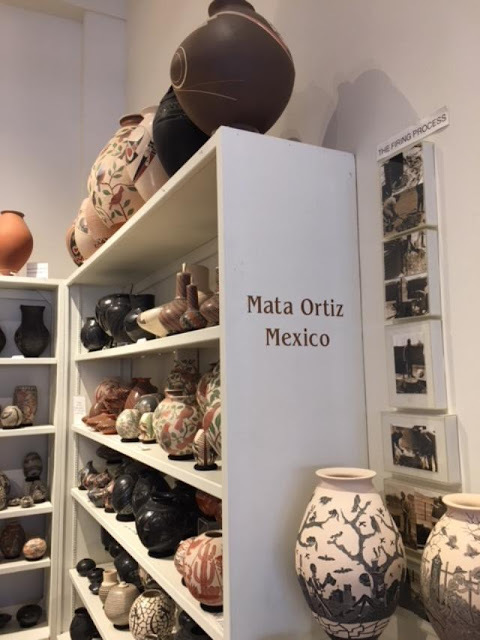 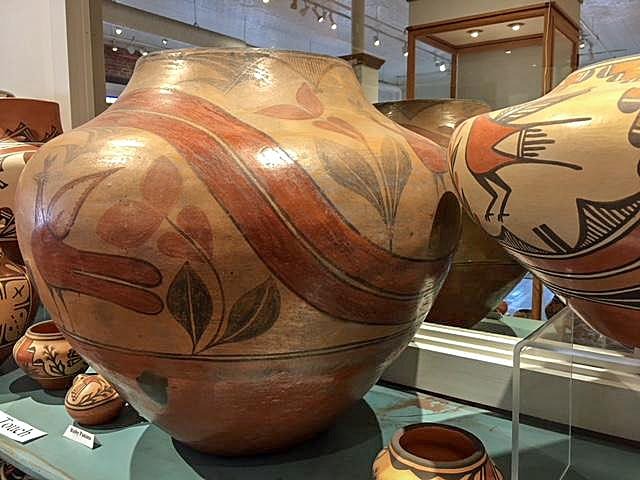 More than 3,000 pots are on display, organized by Pueblo - most from New Mexico with the exception of Mata Ortiz Pueblo in Mexico. All the displays are beautifully composed and marked with signage telling the name of the Pueblo or artist with a brief story of each. 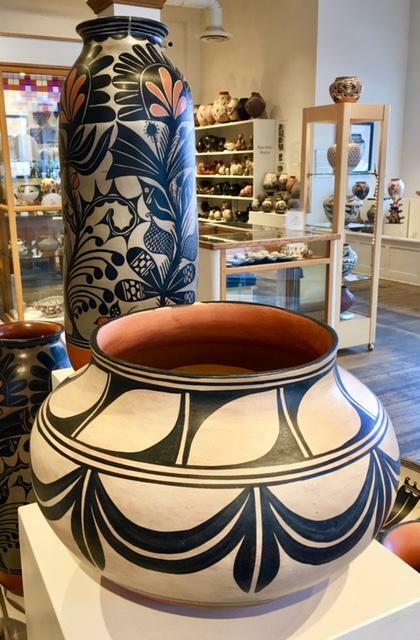 As you walk among the pots, you quickly become familiar with the different styles and painted decorations; beauty and a bit of education as you meander. 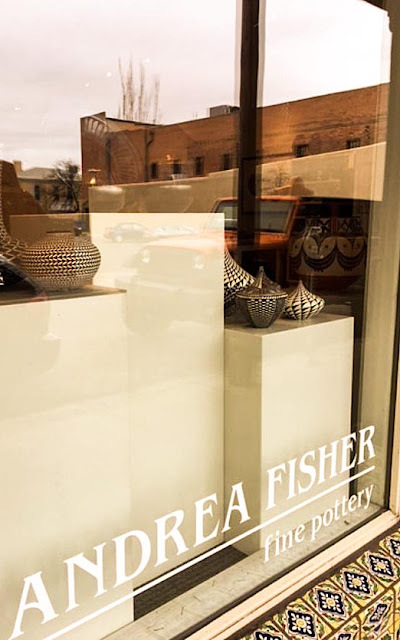 And, if you have a question, the professional and friendly staff are ready to help. 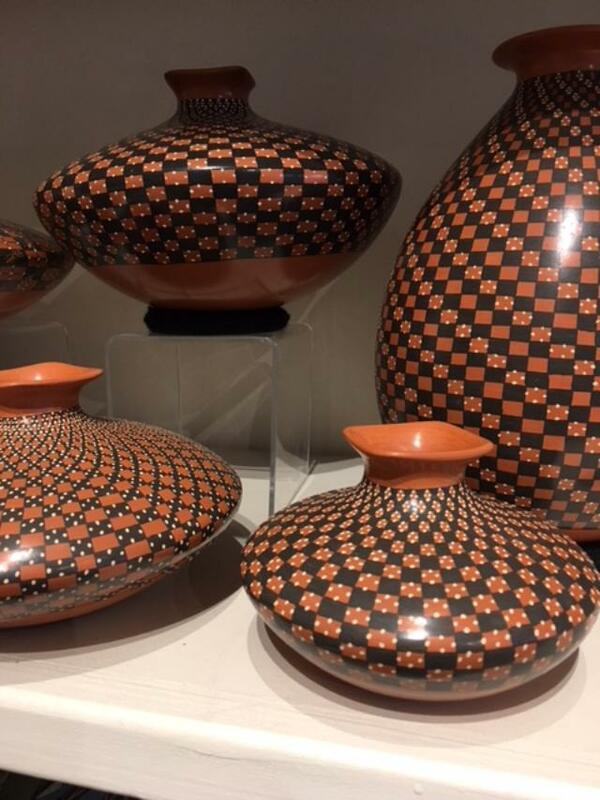 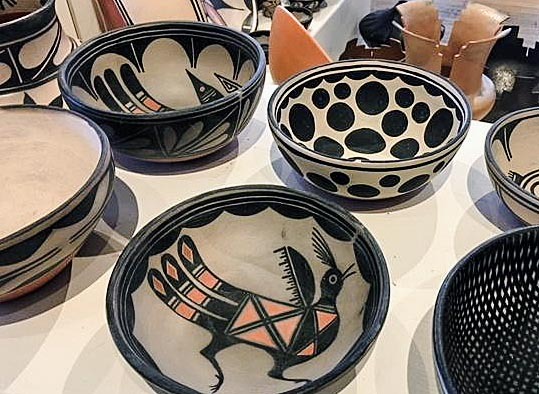 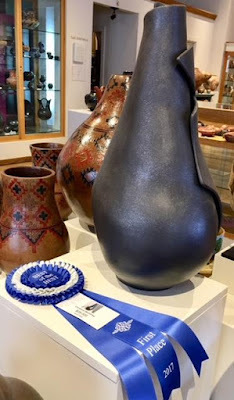 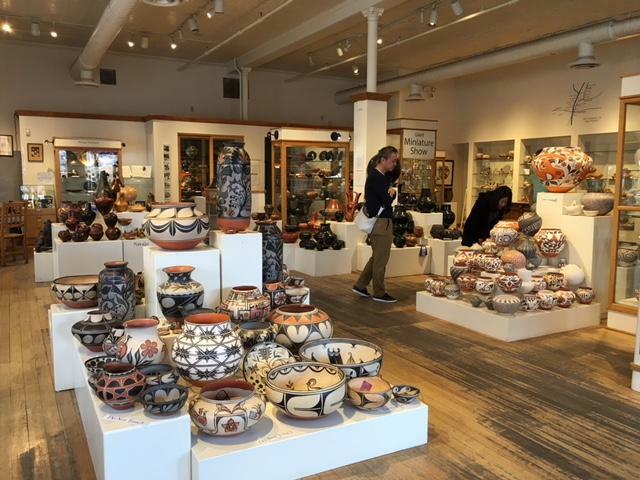 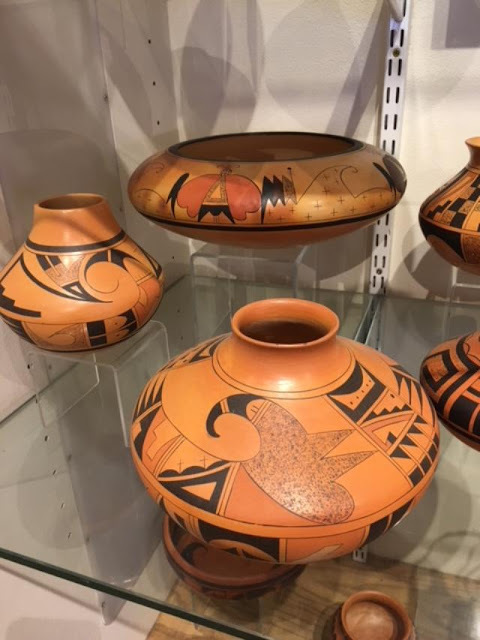 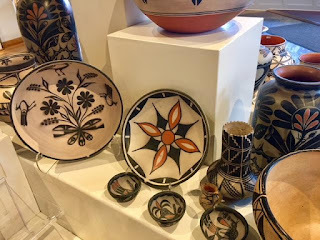 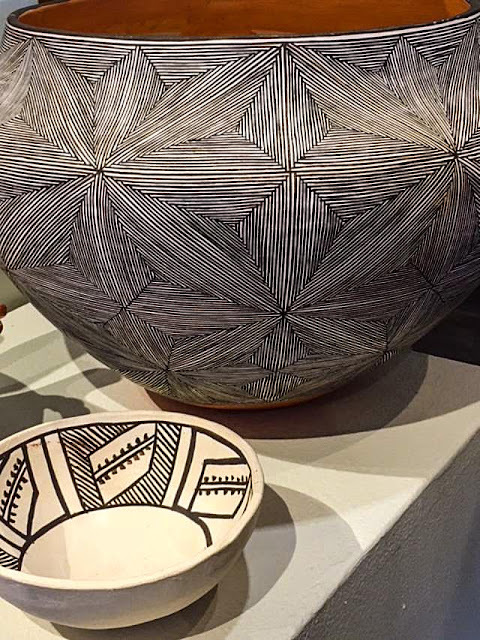 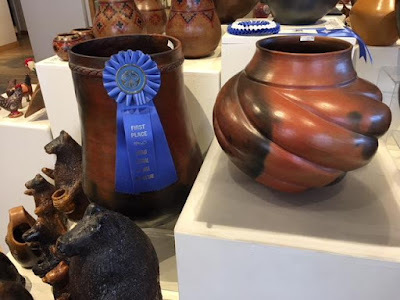 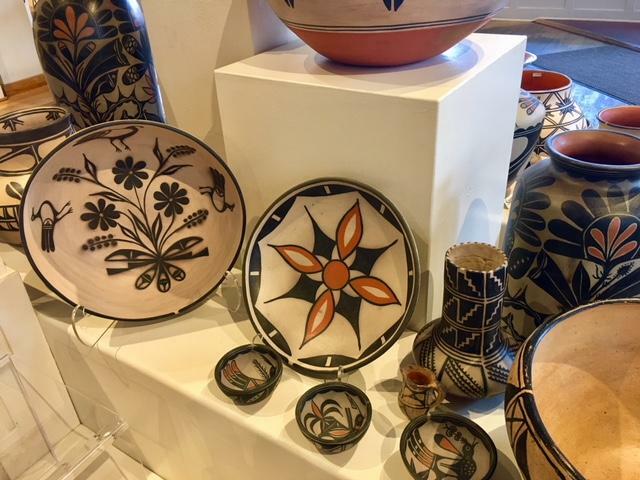 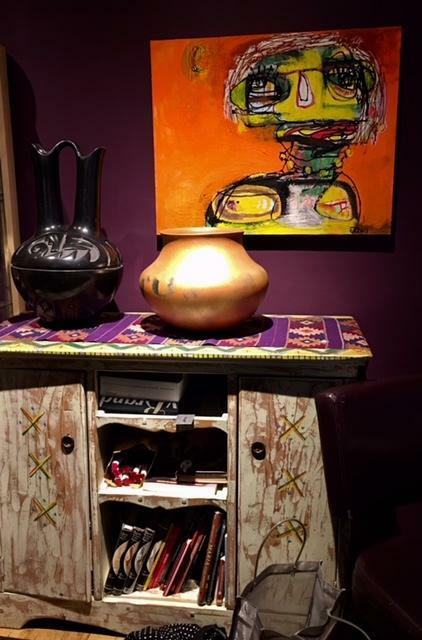 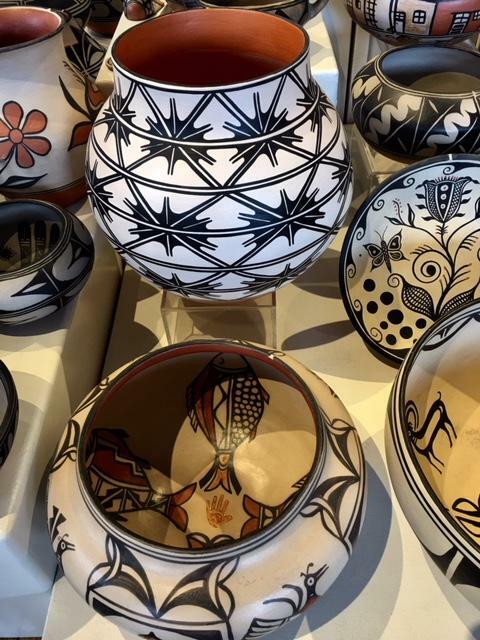 After working as the buyer for the Case Trading Post at the WHEELWRIGHT MUSEUM OF THE AMERICAN INDIAN - Santa Fe, Andrea decided to establish her own gallery showcasing her passion for Pueblo Pottery. 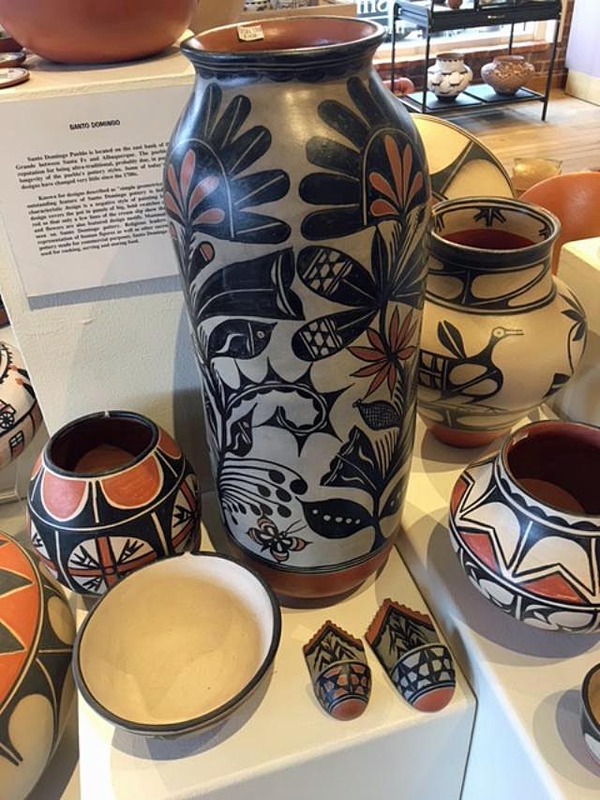 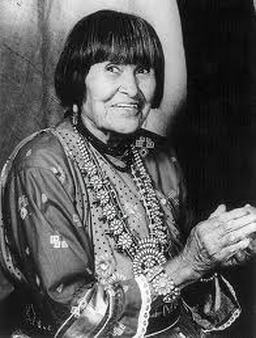 She knew many of the potters personally from her work at the Museum, and that gave her entree to the Pueblos and soon her reputation for selecting authentic and quality pottery spread to both the artists and collectors. 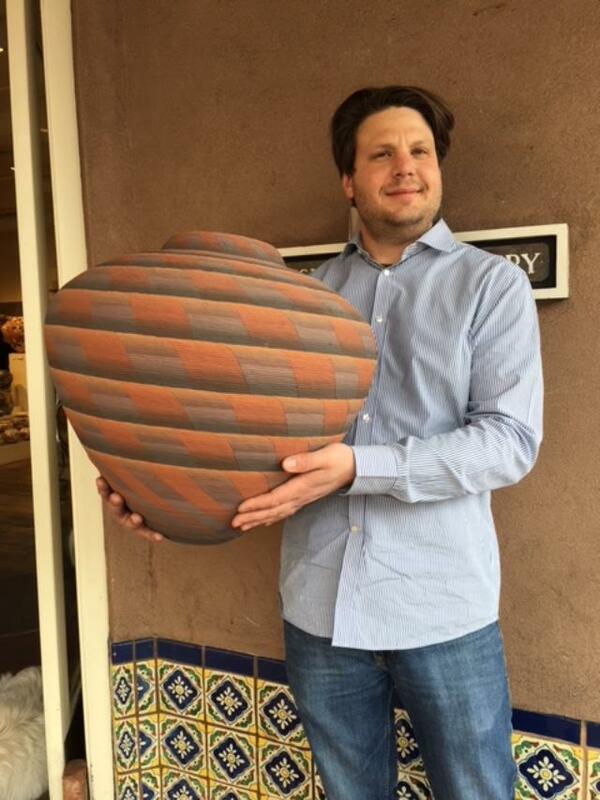 "For many years I would travel to the Pueblos, meet with the artists, see their whole collection, and get to choose. I loved knowing each potter individually - their families and their kids - and following what was going on in their lives," explains Andrea. 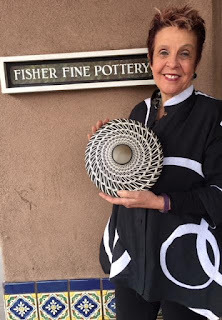 Now, she says, the artists come directly to the gallery, knowing that there is always a parking spot by the loading dock! 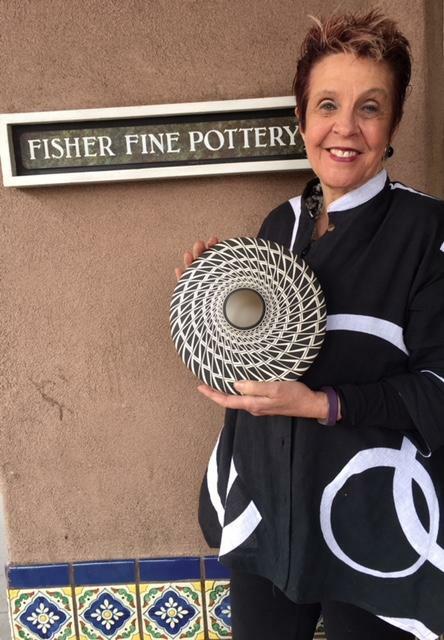 She also loves her customers, finding out their stories and their interests. 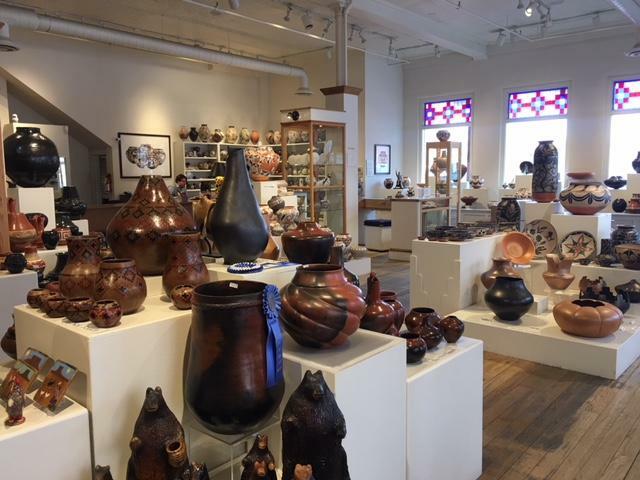 But, her favorite part of owning the gallery, she says with a bit of pride in her voice, is working with her son Derek. Ninety five percent of the pottery in the gallery, notes Andrea, comes directly from the artist; the rest is taken on consignment. 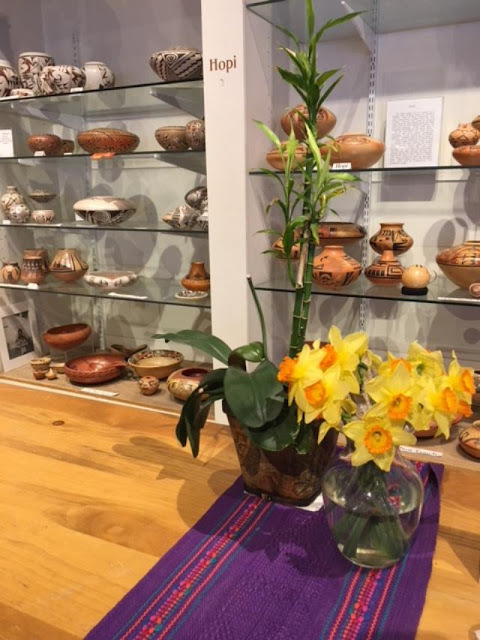 Andrea and I stepped into her vibrantly-colored office to talk about how the gallery will be celebrating its 25th Anniversary. 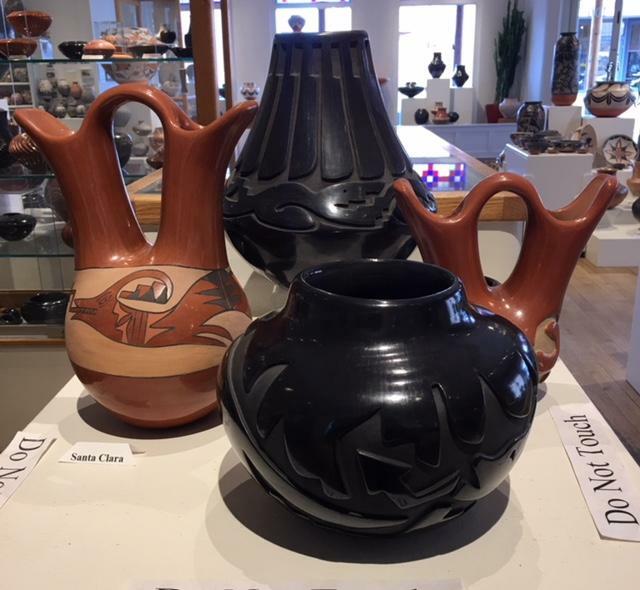 250 Native pots have been culled from the Gallery's collection to be offered for sale during the 25 days of the Celebration - April 5th -April 30, 2018. The pots will be priced up to 25% off and 25 non-profits will receive 10% of the sales on their Designated Day. 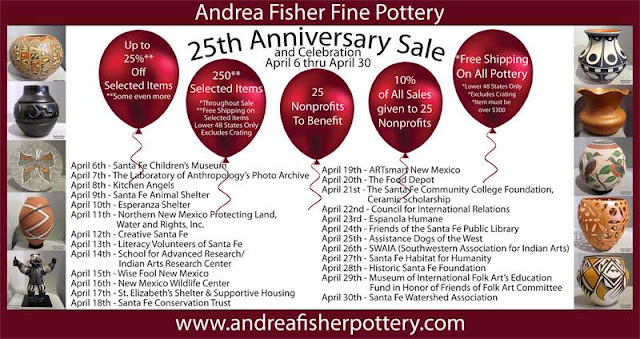 so many worthy not-for-profit organizations," explains Andrea. 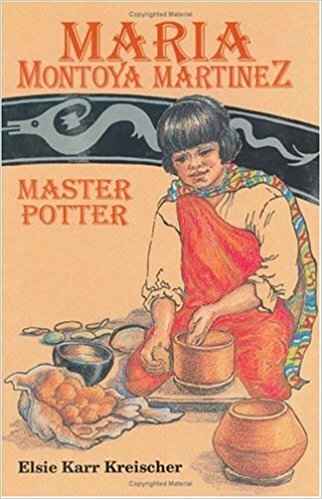 "The ones that were chosen were thrilled!"